Yes, it's been below freezing this week, so many of us are not likely thinking about strolling through a garden, a park, or Fernbank Forest. But, don't rule out any of them just yet. All three are viable options in Atlanta. Centennial Olympic Park and Piedmont Park are busy all year long. But remember Fernbank Forest at Fernbank Science Center, too...it's open to the public, free of charge, and offers 1.5 miles of paved walkways throughout its 65-acre grounds. 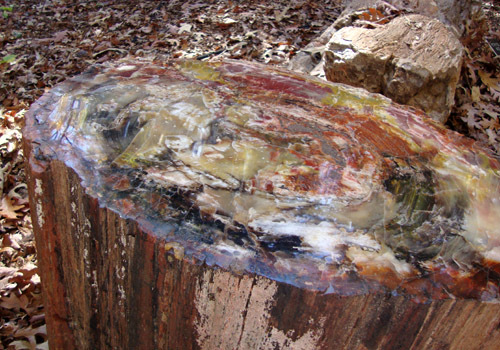 A fossilized tree (pictured here) is one of the many beautiful sights to be seen in Fernbank Forest. Fernbank Forest has been closed now since June of 2012. The gates leading into the forest are locked, and so many people have felt heartbroken that they can no longer venture inside. Fernbank Inc(Fernbank Museum of Natural History)took over the management of the forest almost 2 years ago, and then decided they wanted to close it and use it for extra money, for their patrons only. ATLANTApix: Kate Mulgrew is Coming to Dragon*Con!